You can support Shoreline Ringers just by shopping using Amazon Smile! Instead of making your purchases through amazon.com, go to smile.amazon.com, and choose Shoreline Ringers as your charity, and Amazon will donate half a percent of your total purchase to us. It helps us, and it costs you absolutely nothing! I have brought the Shoreline Ringers to two churches, and the response at both has been very enthusiastic and gratifying. Both the Christmas season programs and the spring programs are full of challenging pieces that are exciting to watch and sensitively played, under the direction of Jane Nolan. The handbell ringers in the group are all very experienced and musical. If you add up the years of experience of everyone in the ensemble (a large number! ), you get a sense of how they can play difficult music so well. We have found that the programs are engaging and popular because they are a nice mixture of classical works (to start off) and more popular and lighter pieces to round off the program. Jane ties the pieces together nicely with some commentary as the ringers prepare for the next piece. Also, a question and answer period always elicits some great questions, often from people who have not heard handbells before and who are fascinated by the very idea of the ensemble combining to make up one instrument. Shoreline Ringers is one of the best handbell ensembles in the region, if not the country. Shoreline Ringers, a Community Handbell Ensemble based in southeastern Connecticut, awes and inspires audiences with their ringing. Under the direction of Jane Nolan, this dynamic and energetic handbell ensemble is dedicated to musical excellence and handbell education through their exciting and uplifting performances. The repertoire performed by this inspirational group is secular and popular in nature, and includes varying techniques and rhythms that promise pleasure and fun for all. 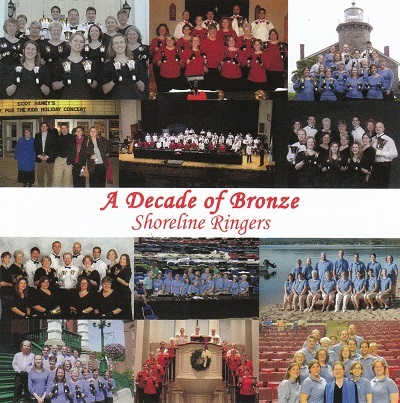 See a sample of Shoreline Ringers in concert: click here.